Chat with us here, or go to our Ask a Librarian page to see other ways to get help. This guide is designed to help you find reliable, accurate information about diagnostic medical sonography. Use the tabs on the left to navigate through the guide. From Ferguson's Career Guidance Center database (STLCC access). Certificate of Proficiency (CP) - Offered through Health Sciences @ Forest Park. This program provides a specialty in ultrasound technology for graduates with an associate degree or two-year hospital-based program in another allied health area. You attend full-time and complete classroom work and clinical education in an affiliated ultrasound department. 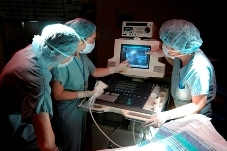 You acquire skills in record keeping, reviewing and recording pertinent clinical patient history, performing the sonographic examination, providing for the comforts and needs of the patient during the examination, and recording the anatomic, pathologic and physiologic data for interpretation by the supervising physician. Students interested in this program should possess effective oral communication skills with patients and all members of the health care team, thoroughness, accuracy, empathy, versatility and the ability to follow precise and detailed instructions.